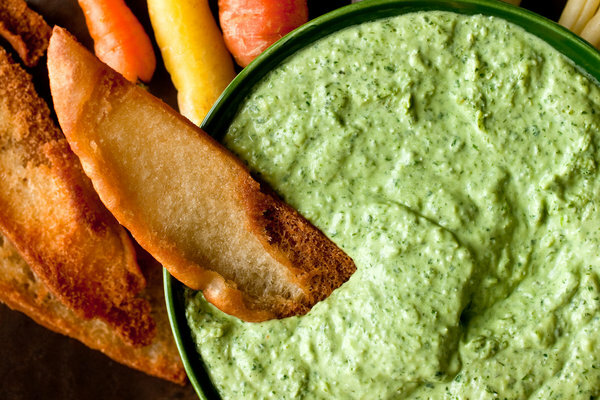 Recipe: green goddess dip. | Noted. This dip is so easy to make, and so easy to serve up with veggies, it outweighs any convenience of buying packaged dip. You can make it the day before. You will happily eat it as a snack if you have any leftovers. There are many variations of a green goddess dip out there. It definitely has some strong flavors with the different fresh herbs, but I find this one to be simple and clean. I use my little cuisinart chopper/blender, which is the best little kitchen tool I could have ever added to my tiny Brooklyn pantry.